Oh, I know I’m an Aussie but I do love Halloween. We have some American friends up the street and every year they have a fantastic Halloween party which is absolutely the best fun! They decorate the whole house, both inside and out, have scary music playing and organise heaps of games for the kids. Last year they actually had the garage set up like a haunted house with cobwebs everywhere, ghosts, black cats, broom sticks, black streamers hanging down from the ceiling…it was really spooky. After quite a few of the children had gone in and wandered around getting lost and freaked out by things bumping into them and going across your face, a group of adults decided it was their turn to show how brave they were. Well, our neighbour had organised for someone to be sitting very quietly in there not moving or making a sound until the group of adults went in. After about a minute of giggling and silly business, he burst into life and set off one of those poppers that have streamers flying out…..we all got the fright of our lives. I’m sure I aged 10 years in that split second. When we finally got our heart beats under control again, we had a big laugh and the kids haven’t let us forget how scared we were since. I can’t wait for their party this year and now that I have released a range of Halloween American Girl doll clothes patterns and Cabbage Patch doll clothes patterns, my daughter and her friends will have their dolls joining in the fun too! I have some great Halloween costume patterns to choose from. There is a Fabulous Fairy costume that includes patterns for a pretty fairy dress, a dainty headpiece and the essential fairy wings. My Wicked Witch costume has patterns for a spooky witches dress and of course, the wicked witches hat. Or my personal favorite is the cool Pumpkin costume which comes with patterns for the pumpkin suit as well as the tights to wear under the pumpkin suit. 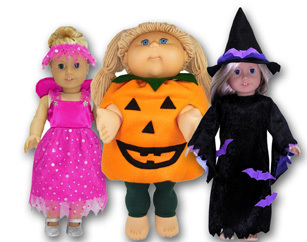 These Halloween doll clothes patterns normally sell for $9.95 each but as a Halloween spooky special, they are now only $7.95 each – that’s a huge 20% discount! All my patterns are downloadable in PDF form with written instructions. And the best part is, you also get LIFETIME access to video tutorials where I SHOW you how to make the outfit – I’m with you every step of the way! So get your sewing machine out and have some extra family fun this Halloween. Create some super cool costumes for your dolls. This offer is only valid until 31 October, 2011 so be quick before the fairy dust runs out!